Praedictix Briefing: Tuesday evening, October 9th, 2018. 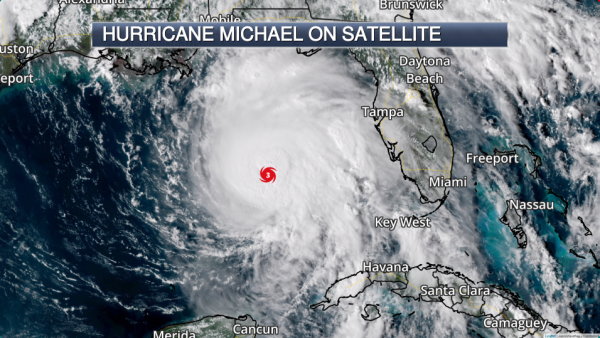 Hurricane Michael is now a major hurricane (Category 3) with maximum sustained winds of 120 mph with gusts to 150 mph. It is expected to make landfall in the Florida Panhandle tomorrow (Wednesday) midday. This a dangerous and life-threatening storm. Final preparations need to be completed immediately as the window of preparation is quickly closing. 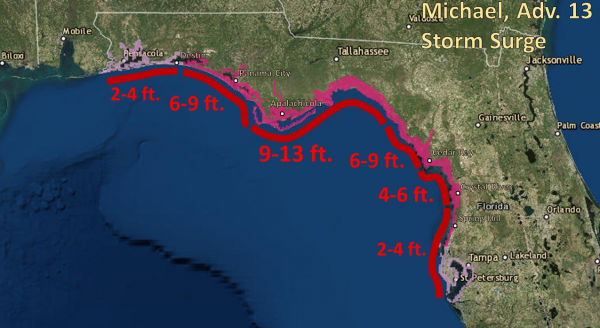 A life-threatening storm surge is likely along the Florida Panhandle, Big Bend, and nature coast with a surge of up to 13 ft. possible. Water level rises will begin in these areas tomorrow. Hurricane-force winds will extend well inland across the Panhandle, southern Georgia, and southeast Alabama with tropical-storm conditions for northeast Florida through North Carolina. Watches and warnings have been issued for the areas of impact. Michael will be the strongest hurricane to hit the Panhandle region in 13 years and is expected to be the strongest hurricane (based on wind speed) to make landfall in the continental United States this year. 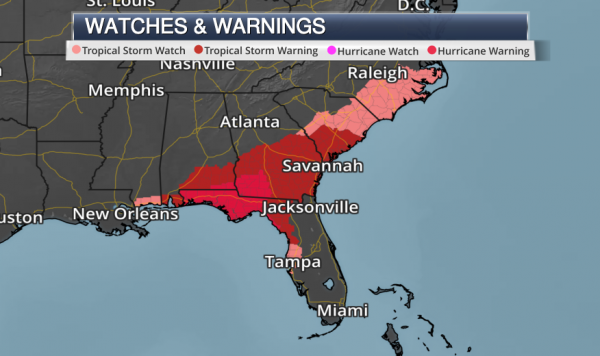 More than 20 million people are under watches or warnings across five states: Florida, Alabama, Mississippi, Georgia, and South Carolina. Tallahassee’s airport will be closing at midnight tonight. Michael on Satellite. The eye of the hurricane became very distinct earlier this afternoon and has assumed a very “classic” hurricane look. This has indicated strengthening and sure enough, the latest reconnaissance mission has confirmed this. Michael is now a Category 3 hurricane with maximum sustained winds of 120 mph. The outer bands of Michael have been already impacting the Florida peninsula with waves of heavy rain and even a minor storm surge reported in the Fort Myers area. Weather conditions will continue to rapidly deteriorate for north Florida as Michael approaches. Latest Track Update. Michael continues to track through favorable conditions in the next 12 to 18 hours, which could lead to further strengthening before making landfall. After landfall, rapid weakening will occur. However, tropical-storm conditions are still likely for much of the Southeast, including the Carolinas. 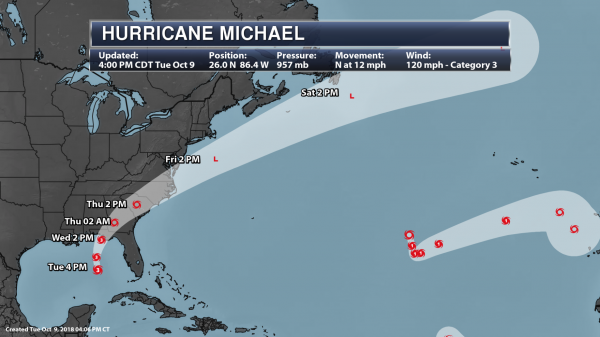 Michael continues to move generally north-northwestward with a slight turn northward expected tonight. Little change in the overall track occurred at the 4 PM update. The storm will see an increase in forward speed, which places the center of the storm in southwest Georgia by Thursday morning and then South Carolina by Thursday afternoon. Hurricane-Force Winds Extend Well Inland. Hurricane-force winds currently extend out 45 miles from the center of Michael with tropical-storm-force winds extending out up to 175 mph from the center. 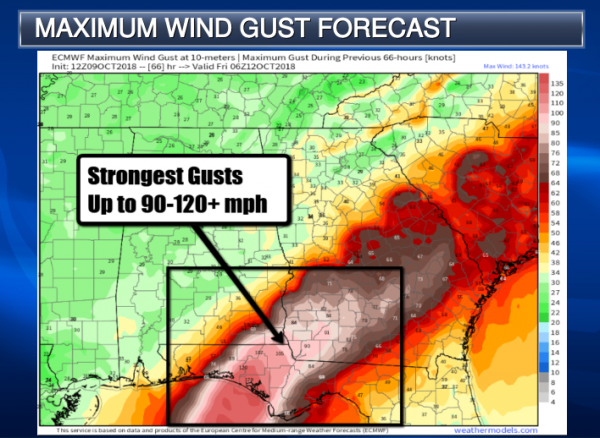 With Michael’s current track, the strongest winds will occur in the Panama City Beach with hurricane-force winds possibly into the very southeastern tier of Alabama (including Dothan) and southwestern Georgia (including Albany). These areas are currently under hurricane warnings. As stated in our last briefing, these damaging winds will result in widespread power outages that could last for days if not a week or more in areas, along with major tree and structural damage. Strong wind gusts of at least 40 mph will continue along and mainly to the right of the center as Michael continues to move inland across parts of Georgia and the Carolinas through the end of the week, which would also have the potential to knock out power. Widespread Torrential Rainfall. Heavy rain associated with Michael will have a widespread impact in the southeastern United States. We’re expecting the heaviest precipitation to accumulate in a line from the Florida Panhandle to the Carolinas, where a swath of generally 4″ to 10″+ will be possible. 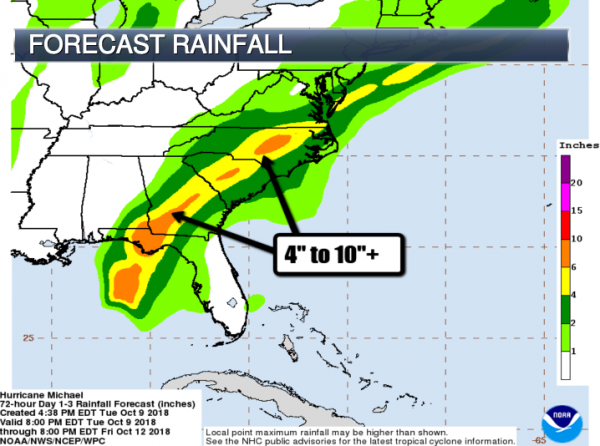 The highest totals will likely occur in the Panhandle and Big Bend area of Florida, southeast Alabama, and parts of southwest and central Georgia where 4″ to 8″ will be commonplace with isolated totals up to 12″. The remainder of Georgia, the Carolinas and southern Virginia will see 3″ to 6″ with isolated 8″ totals. Elsewhere, 1″ to 3″ will be expected. Flash Flood Watches in Effect. With the widespread, heavy rain expected from Michael, the areas likely to experience flash flooded are currently under a Flash Flood Watch as the system approaches. 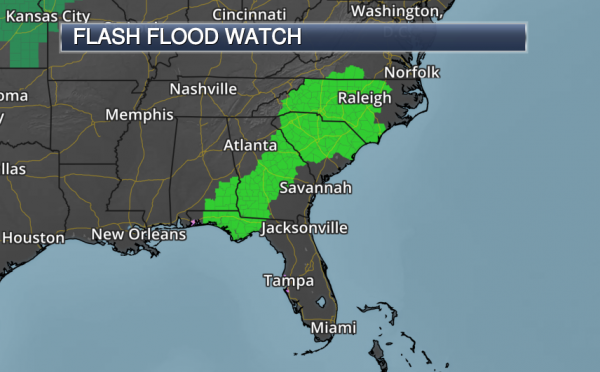 Cities in the Flash Flood Watch include Tallahassee FL, Panama City FL, Apalachicola FL, Albany GA, Macon GA, Augusta, Columbia SC, Charlotte NC, Raleigh NC, and Danville VA. Learn more about our corporate weather briefings here.